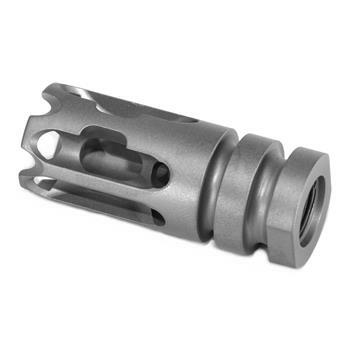 The T3 Titanium is a dual baffle compensator that directs expelled gasses to control muzzle direction. The initial baffle directs gas in a geometrical pattern that stabilizes the rifle system. The second baffle system channels gasses upward to compensate for muzzle rise. This gives the shooter the ability to decrease time between follow up shots and maintain control of muzzle direction. The T3 also mitigates some of the flash that is commonly associated with compensators when used on 16" and longer barrels. The T3 Titanium is made from 6AL-4V Titanium, and represents a lightweight mounting solution for the GEMTECH GMT-HALO as well as the standard HALO suppressors.